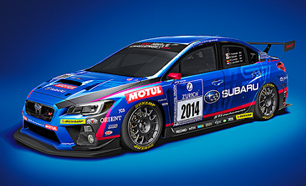 There’s more meaning to the new STI racing livery than meets the eye. 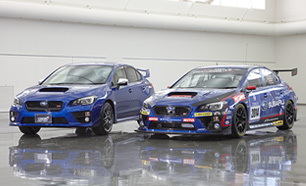 “WR-Blue” represents Subaru and their storied history of competition in motorsports, and “Cherry Red,” is emblematic of STI and our insatiable thirst for success racing. Motorsports has taught us a valuable lesson: the technology required to build a high-quality production car is synonymous to the technology needed for racing success. 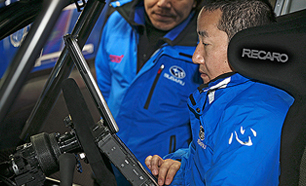 The “Enjoyment and Peace of Mind” experienced by an ordinary person driving a Subaru production vehicle can also carry a professional race driver to the finish line. Our dedication to fielding Symmetrical All-Wheel Drive and the SUBARU BOXER engine in competition is explained by our mantra,“attaining ultimate in driving will attain ultimate in safety.” If our technology improves results in competition, it will certainly improve lives on the road. We have chosen the Nürburgring as our symbolic proving ground for a reason. The Nürburgring Nordschleife is one of the most challenging, unpredictable circuits in the world, and it’s a place where our technologies and philosophy can shine. Whether competing for lap records, or challenging the competition in the Nürburgring 24-Hour race, our dedication to this precarious track is resolute. A collaborative development by Subaru and STI, the Nürburgring Challenge racecar is “Enjoyment and Peace of Mind” in motion. Its strengths – communicative, confident handling – are supremely evident in the production model it’s based on, the 2015 WRX STI. Preparing a car to compete in this grueling 24-hour race is the ultimate engineering test. The lessons learned and knowledge gained will be applied to every STI vehicle and performance part we make. This is the STI tradition. It’s a common scenario – a racecar with unlimited horsepower, tremendous grip, slippery aerodynamics, space-age materials, and powerful brakes struggles to finish in the top 10. Why is this? Their engineers failed to address the most important ingredient – drivability. To STI, maximizing drivability is paramount to racing success. It’s an indispensible quality, assuring consistency and confidence in the driver. A confident driver can push through adversity to victory against more powerful, faster foes, no matter the conditions. Drivability is a constant in every racecar we’ve ever built. A racecar that can be driven confidently can also be driven competitively. This is our engineering mindset, and that’s why “Enjoyment and Peace of Mind” can be experienced in all the production vehicles our racecars are based on. On the left arm of every WRX STI NBR Challenge team member, you’ll see the Japanese Kanji character “心” which means spirit. In the heat of battle, the STI team unites together as one to fight for victory. STI applies this spirit to all challenges, whether racing, or building a vehicle, or designing new performance parts. Description: Explore the 2015 Subaru WRX STI. The best-handling, best-performing WRX STI. Ever.